I joined UpLift in November of 2006. 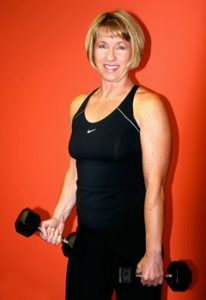 When I started, the only thing I knew about resistance training was that it was something I “should” do, because it was good for maintaining bone density and gaining core stability. I never thought I could gain visible muscles. I cannot believe how much my feelings have changed! Resistance training is the key to fitness and good health. I love lifting weights. I plan to have resistance training in my exercise plan forever. I have lost 20 pounds without really trying. I’ve lost inches and measurements. I’ve gained muscles that I can actually see. I’ve made changes to my diet with the guidance of UpLift. I eat more whole grains, more blueberries, and more vegetables than I ever had before. UpLift is an incredible place to start and continue your exercise program. The personal one-on-one attention is second to none. If I have a question, there’s always someone there to help. The monthly program changes are essential in keeping fitness fun and interesting. The personal attention that I get at UpLift would cost much more money at another gym.